Don't forget! The Bloggers Bake for Hope bake sale opens today! Be sure to bid on some of these tasty treats to raise money for breast cancer research! This is a quick, easy, healthy and delicious pizza recipe that you just might want to make this weekend for Cinco de Mayo. It's full of taco flavor and you can add as many of your favorite taco toppings as you like. Pizza is one of those wonderfully versatile dishes and even this recipe can be customized to your tastes. The ciabatta bread makes a wonderful base to hold a lot of toppings and the whole thing really reminded me of the French bread pizzas we'd have on rare occasions when I was little. Dave and I had this for dinner (and leftovers) and it was perfect. This will be a lot of fun for a variation on pizza night or taco night! Meagan from A Zesty Bite posted this last month and I immediately knew I wanted to try it, so of course I pinned it. I made a few variations on the recipe, starting with decreasing the amount of turkey to 12 ounces and increasing the black beans to a full 15 ounce can. (The adjustment to the turkey was purely because that's what size package I had in the fridge after breaking down my BJ's-sized quantity.) I also added taco seasoning to the cooked ground turkey and a bit of taco sauce to both coat the bread and drizzle on the toppings. I adjusted the cheese to taste and omitted the olives, tomato and avocado, since Dave's not a fan. See? A completely adaptable meal. I'll be making this again this weekend when we host our Cinco de Mayo party; maybe you should share it with friends over some cold beers too. Conversation between Dave and I as we started to prepare dinner. Dave: I'm going to go start the grill. Me: Ok. Would you be interested in me making a dessert? Me: Ok. (Dave stares at me, waiting to learn what dessert is.) Carry on. I mean seriously, when you're making dinner, it's easy to pull out a cast iron skillet and fake people into thinking it's just part of dinner. I really wanted to try this recipe because I like any excuse to season my cast iron, it sounded fun, and there is a place for big cookies in the world. Namely, in my belly, but I'll share, since this cookie is meant to be shared with at least one other person. It's that time again! 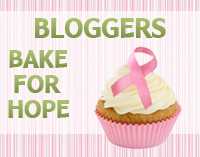 For the second year, I'll be participating in the Bloggers Bake for Hope fundraiser. Last year the group raised $3000 for breast cancer research. This year we'll be raising money for the Avon Foundation since Jen (of Beantown Baker) and Fiona (of A Boston Food Diary) will be participating in the Avon Walk for Breast Cancer. Both Jen and Fiona are committed to raising $2000 each, so please help me help them reach their goal by bidding on some of the delicious goodies in this year's bake sale. This is a great fundraiser since there are no costs and all the proceeds will go to the Avon Foundation. 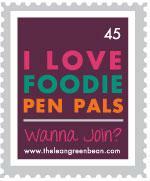 Each blogger volunteers to donate a recipe to the cause mail it to the winner directly. The online bake sale auction will be live on Monday, April 30th and run until Wednesday, May 2nd, so be sure to pop on over to the bake sale site on Monday and bid on all the yummy deliciousness. I'll be sharing Trail Mix Jumble Cookies and Peanut Butter Chocolate Chip Cookie Bars this year. Please join us in making this another successful year! I can only imagine the name for these cookies is a result of the very simple flavors coming together to make a pretty delicious cookie, much like a lot of Amish treats. It's all very subtle with a touch of spice, a little oats, and a bit of dried cranberries for sweetness and the result is a cookie that is both crisp (on the outside) and chewy (on the inside). Dave's parents are on their way back home after having been traveling with their camper since New Year's. They are slowly making their way back up the East Coast and are stopped in Kutztown, Pennsylvania, not far from where they both grew up. They'll have a chance to visit family, which is good because it's an address where Dave and I can send their mail (we've had a chance to send it to them several times in the past few months, but it still accumulates quickly). What better treat to send along than some cookies paying homage to the Pennsylvania Dutch region where they'll receive them? Page by page, I flipped through the King Arthur Flour Cookie Companion until I found the "right" cookie to send them. These cookies are simple to make, a tribute to the simple flavors I suppose. The dough came together while Dave and I cooked our dinner the other night (he was grilling our steaks while I was in charge of potatoes and veggies, so while my stuff didn't need "tending," I was able to make the dough.) It chilled while we ate and after dinner, I stuck them in the oven. Following a tip in the cookbook, I practiced getting more space on my cookie sheet by staggering the balls of dough. It worked pretty well and probably would have done better if my cookies were the right size because a few of them did start to touch. The recipe said it yielded 4 1/2 dozen, but I only got 4 dozen--it's likely that had I made them a bit smaller to squeeze out the extra 6 cookies, I may not have had the cookies touch. Either way, these are a delicious treat and I really likes the twist of using brown sugar and cinnamon for rolling other than the traditional white sugar and cinnamon topping. I did substitute dried cranberries for raisins, and I like the pop of flavor they provide. Make these cookies for an afternoon tea or just a sweet treat for yourself or to share with others. They may sound old fashioned, but it's a flavor combination that's a bit unusual and a lot delicious. This is a quick and delicious recipe that has been in our rotation for a few years now. I love it for a few reasons, not the least of which is that it's super tasty. I like that I can change the intensity of the heat based on my preference and the type or amount of chili powder I use. I like that it can be make lean with turkey or I can just enjoy the beef. I like that it doesn't care how much cheese I use so on cold days I can dump in a ton of gooey cheddar and on other days I can let the vegetables and sauce sing. And I love that it's a perfect freezer meal and feeds a crowd. Which is why I made this the big meal I took over to Cindy's house after Jessie was born. It was still frozen when I brought over, so Cindy stashed it for later, but I'm pretty sure that after they defrosted and warmed it up, they ate it for about a week. Mmm, cheesy, beefy, spicy pasta for several days in a row. I'm not too proud to say that I'd eat this every meal until it was gone. This is actually a Rachael Ray recipe from her 2, 4, 6, 8 Great Meals for Couples and Crowds cookbook, under the name Three-Alarm Italian-Style Chili Mac (a bit long for my tastes, and we just call it Chili Mac around this house). Technically it's from the section on meals for 6, but I make it for just Dave and I and we generally get 8 servings out of it (more than enough). It's definitely a filling meal. I do make a few swaps. Like I omitted the olive oil to brown the meat in (I just don't see the need for added fat when I use a non-stick pan). I usually only use a pound of ground meat instead of one and a half pounds. I use regular crushed tomatoes because I can never find the fire-roasted crushed tomatoes and for cheese, it's whatever I have on hand, not necessarily smoked cheddar. And sometimes I even transfer it to a casserole dish and broil the cheese for a little browned cheesy topping (like the recipe says). Other times, I just fold in the cheese and call it a day. While I wouldn't say I have it on the table in 30 minutes (my kitchen isn't that organized), I will say that it's pretty quick and doesn't take much more than a half hour. Whip this up and share it with friends. It's great for a pot luck, a delivered meal, or just a yummy dinner for the family. I don't even know where to begin with these. These are amazing muffins. Full of crazy delicious flavor, pretty to look at, and a wonderful treat for brunch or a pot luck. And I don't even like carrot cake. Not sure why, it was just never a flavor that I could get into. If carrot cake was an option, I'd most certainly choose anything else, and if it was the only thing, then I'd just forgo dessert. I like veggies and I like desserts, but I guess I just preferred if they minded their own business and kept to themselves. But these. Oh, these are a muffin I can get behind. I took them to work for a morning meeting where they were well received. Then around 3 pm the meeting chair wandered into my office, asking, "Do you have anything sweet left from the meeting?" I did, shared with him, and he said, "These are so good. What are they?" Is that not the best compliment? It screams "job well done" when someone admits they have know clue what they are eating but it's so damn good I just want more. This recipe is a recovery from a carrot cake I tried to make that FAILED. Ug. It was beautiful, fragrant, perfectly golden and the cream cheese frosting smeared beautifully on it. Then I sliced into it to find it was completely undercooked despite my having tested it numerous times. (Stupid oven...you just wait until the appliance guy shows up and gives you what for. Or at least I hope he gives you what for and doesn't tell me I need a new oven.) (Don't worry--I'd sliced the cake before I took it to work and was able to have enough time to whip up something else to take that day.) The next week, discouraged by my cake catastrophe, I took to Pinterest hoping to find something I could make in a carrot cake-style. I searched "carrot cake muffins" and this pin was practically the only picture that showed up. I remembered that months ago I'd actually pinned this King Arthur Flour recipe myself, but forgot. This recipe is amazing. It was super quick to put together, even with layering the batter and filling. It uses Fiori di Sicilia, which I realized I'd picked up last fall when I visited the King Arthur Flour store but hadn't used yet. It's a wonderfully unique flavoring that provides a subtle citrusy flavor (don't worry if you don't have any, you can omit it and still have a lovely muffin). I actually really liked how the filling broke through the surface of the muffins--they look very inviting and delicious, but I think next time instead of doing two scoops of batter on the bottom and one on top of the filling, I'd do the reverse. I just didn't seem to have enough batter to cover the top of the filling in the muffin tins. Either way, these are amazing and have definitely made me a carrot cake convert! One of my favorite favorite after work snacks/pre-dinner appetizers is pita and hummus. While pita chips are great (and you can make them from this recipe), fresh, soft, lovely pita bread is really what makes me swoon. Sometimes, I'll just pack a pita and some hummus for lunch with a salad. It's perfectly light, flavorful, but still filling. So learning to make my own delicious pita bread was a definite to-do. This recipe results is a lovely base pita bread that you can season to your liking--with just a little kosher salt or a bunch of herbs and spices that really pop. And if you roll the dough just right, you'll get lovely pita pockets perfect for stuffing with all kinds of fun sandwich-y stuff. I've made this recipe a handful of times and each time have been pleased with the results. It's pretty simple to make, and with two rises, there's a bunch of down time. I've made this both by hand and in the stand mixer and I must say I've gotten my best results by using a hybrid approach of starting in the stand mixer and then kneading by hand. Jen at Beantown Baker shared this recipe and it's perfect. Simple and delicious, you'll find yourself eating this up quickly and wanting more. I usually freeze several of the pitas so they'll last longer (microwave for about a minute and a half and you've got fresh, soft pita). I've also cut them into wedges and popped them back in the oven to make pita chips, seasoned up with lots of sea salt. No matter how you enjoy this stuff, you'll be pleased with the recipe and find yourself back in the kitchen making another batch. Yum. This is good. A healthy version of a taco casserole that carries a bit of spice, a creamy, cheesy sauce and really satisfies. This is a great dinner, easy to put together after work and enough to feed a family or provide some tasty leftovers for lunch. I was surprised at the heat, but really liked the creamy sauce. Dave couldn't get over it and ate up most of the leftovers (which were just as good as the first night) before I got a chance. This is perfect for a crowd or a pot luck, since it's a bit different. And with turkey, fat free cream cheese, fat free sour cream and reduced fat cheese, you can make this a healthy dish as well. This month, the Secret Recipe Club paired me with Join Us, Pull Up a Chair, and I was excited to sort through so many of Heather's delicious recipes. I had a hard time choosing, so I narrowed down the choices to five, including Mini Chocolate Chip Scones, Cheesy Jalapeno Beer Bread, Wagon Wheel Taco Pasta Salad, and Roasted Red Pepper Hummus, along with this Creamy Taco Mac recipe. I let Dave choose and after much hemming and hawing, he was intrigued by the Creamy Taco Mac, so we enjoyed it for dinner one night. Delicious. I did add a teaspoon of cumin to the recipe because I like the smoky flavor that develops the Mexican tones of this meal. I'm so glad to have had the chance to explore Heather's blog a little bit more and can't wait to try a few more of her recipes. Be sure to check out some of the other recipes in this week's reveal by clicking the blog hop following the recipe. Yeah...so I made these a while ago and apparently never took a pretty photo of a stack of granola bars. And we ate them all. Oops. Remember the other day when I told you I made two batches of Applesauce Granola in a day? Well, it wasn't because I ate all of the first batch. The first batch, made without cranberries or other dried fruit, went into making these wonderful granola bars laden with peanut butter and chocolate. A soft, chewy bar, they rival the store bought variety. The chocolate and peanut butter flavors from the chips were the perfect match to the nuttiness of the granola. Overall the bars weren't too sweet and were pretty low on the fat/sugar scale compared to store-bought versions. I scoured Pinterest for granola bars that I could make using my homemade granola that didn't have too many other ingredients that might not have a home in my kitchen. I giggled when I found this recipe from Emily at Back to the Cutting Board because she too uses Amanda's Applesauce Granola from Fake Ginger. Guess it really is a winner. Emily did a very thorough job testing three different chewy granola bars, providing lower sugar options, and including several tips and tricks to get the perfect bars. Dave really likes to have a granola bar for a mid morning snack, so I make a double batch for a 9 x 13 pan based on Emily's recommendations. One thing I did was to include my chocolate chips and peanut butter chips mixed into the dry ingredients rather than smooshing them on the top of the bars. This resulted in a melt-factor when the hot syrup hit the bowl so the "chips" weren't defined. While I liked the flavor that resulted, I would have enjoyed some chippage. So instead, I would put maybe half the chips in the dry mix and reserve the remaining chips for topping. These are great treats that hold well stored in an airtight container and are a great lunch box addition. Make up a batch and you'll never by store bought again! A slightly tart filling atop a crunchy shortbread studded with cranberries, these are a nice twist on the typical citrus bar. The combination of cranberries and lime is an underused flavor in desserts, and I happened to make these twice in a week, once for a work meeting and the second batch for Cindy's birthday/a celebration treat for Jessie's arrival (since I didn't get a chance to see Cindy for her birthday). The sweet and tart flavors are a nice addition to the shortbread, which is simple except for the unique addition of cranberries. Whenever I need a quick bar dessert with a little different flavor, I've found that my Christmas Cookies book has a ton of easy recipes that are traditional enough that they seem like new takes on regular recipe. My alteration to these bars was that instead of using pecans in the shortbread, I swapped them out for the cranberries. Also, since I don't have a 12 x 8 inch pan, I used a 13 x 9 and scaled the cooking time back a touch. And it totally worked. Two bowls, a whisk and a pastry blender are the tools you'll need to create these simple yet very flavorful bars. A tasty quick bread with a great lemon flavor and a sweet light glaze. I loved this recipe because it made two loaves, came together quickly and the lemon really shined without being overly tart or sour. The glaze is light and brings a bunch of lemon flavor, but since it's added while the bread is still warm, I think it adds to the soft, moist crumb of this bread. Since it made two loaves, I took one to work for a meeting and gave half of one to Cindy since she loves lemon. (Dave and I ate the other half.) Rave reviews all around, with one of my colleagues even asking if I'd made the bread because it was delicious. I won't lie--I get tickled every time someone compliments me on a new recipe. This lemon bread was a result of having 3 lemons in my house and no idea what to do with them. So I scoured Pinterest for a recipe that would be assuredly lemony. I finally found the right recipe from Lind at Stick to Your Hips. This was a perfect recipe, although I opted to leave out the various berries. I had some strawberries and blueberries on hand, but really just wanted to focus on the lemon flavor coming through. This could easily be adapted to mini loaves, but I went with 2 loaves, one in an 8 x 4 pan and one in a 9 x 5 pan. Yummy and delicious. Make one for yourself and share one with a friend. Time for more birthday baking. My niece Abi turned 6 (6!) on Monday. Of course being the wonderful aunt I am, I had to send her something sweet and tasty with her gift. And what better treat for a birthday girl than something that tastes like birthday cake. I opted to use pretty pastel pink, purple and orange colored frosting to sandwich these sweet sugar cookies flavored with yellow cake. This is a pretty quick recipe aided by a prepackaged cookie mix with a little cake mix added to the party. Cute, perfect for birthday celebrations and yes, very tasty. Plus there is something about a sandwich cookie that's just plain fun. This is a Betty Crocker recipe and is very easy to make. The original recipe suggests using neon colored food coloring, but being spring and almost Easter, I went with the softer classic colors to end up with more pastel shades. Also in the original recipe is a butter cream frosting recipe. I went with a premade canned frosting instead because I knew I'd be shipping the cookies and didn't want the frosting to go bad. Either way, these cookies are a great treat for a birthday party or any other time needing a little colorful, cake flavored fun.